It's true, believe it or not – four adult green sea turtles known as Chelonia mydas have found a new temporary home in Dalhousie's Aquatron. Two of the turtles, whose species is considered endangered, will eventually make their way to the Ripley's Aquarium of Canada, now under construction in downtown Toronto next to the CN Tower. Expected to be completed in the summer of 2013, the aquarium will be their new "forever home" as Aquatron manager John Batt puts it. Update, June 7: The other two turtles have now made their way to their new home: the Henry Doorly Zoo & Aquarium in Omaha, Nebraska. The turtles—Merv, Ambrose, Chewy and Spot—were born in captivity, and originally housed at the University of British Columbia where the facilities were undergoing construction. "They had to come east first [before taking residence elsewhere] because there's not many places equipped to do what the Dalhousie Aquatron can do," says Mr. Batt. "UBC and Ripley’s were very familiar with our facilities, so they decided that this might be the place to come." The green sea turtles will be cared for under the direction of Joe Choromanski, vice-president, husbandry at Ripley's Aquarium of the Smokies, with more than 30 years of marine science experience. "We needed to find a place that is in Canada that could house these (animals) and Dalhousie was certainly our first choice," he says. "Because the Aquatron is so versatile, they can do cold water or warm water. It was just a logical choice for us." Though the Aquatron often hosts marine species, alongside other water research activities, Mr. Batt says that these guests are particularly special. “All the staff love them. I’m surprised when we open to the door and there isn’t someone in there visiting [them]. They’re fun, they’re interesting, and they all have their own personalities. We are actually training them to eat a special way so that when they go to the aquarium they will already have some of the basic training down." The three turtles sharing the Tower Tank are fed from three different locations. They’re each given a shape cue—a circle, square or triangle—and are learning to associate their own food with a particular shape. “If you just throw it in for a free-for-all, one guy is going to get all the food." Along those lines, one turtle—Merv—is spending most of his time on his own; he wasn’t exactly getting along with the others. "(Aquatron) staff were trained by our staff and they can take care of turtles,” says Mr. Choromanski. “They are also holding other things for us, some lobster and some cod and a few other animals from the North Atlantic for our aquarium as well. "The sea turtles were a more unique situation because they're a warm water animal and the Dalhousie staff had never worked with them before so we worked together on that. Our veterinarian was there on their arrival and he's going back to Dal for a health check in the end of June." 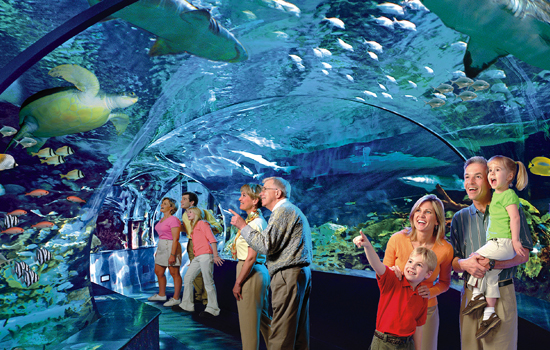 While the turtles’ age isn’t known, the species can live to be over 100, and Ripley’s expects the turtles to be a staple at the new aquarium for several generations of patrons.